When AFL football fun combines with seriously deadly swamp monsters, you get an early reader with kick. Nick is just another player in the Under Eleven Cobar Creek Crocs team until he is named captain. Nick is determined that his captaincy will mark the beginning of a new era: could the Crocs can even win a game for once? But things are never that simple. 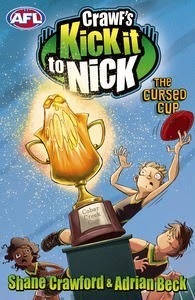 In The Cursed Cup (Book 1), the new Cobar Creek football oval is built on top of swampland but something or someone is not happy. Weird things start happening. The Cober Creek Cup burns the hands of anyone who tries to hold it and metal from far and wide is attracted to the trophy. Is it just Nick’s imagination or is something even more frightening about to happen? In Forward Line Freak (Book 2), a strange weed with purple flowers emerges among the footy oval’s grass. Nick falls flat on his face during a game and takes a big sniff of the flower. What follows is more than weird. It’s just plain freaky. Could Nick be the monster roaming the streets at night? How can he return to normal? Hidden within each tale is a key football skill that will enhance any football player’s game. Photo diagrams and a step-by-step guide to practicing this skill are in the back of the book. 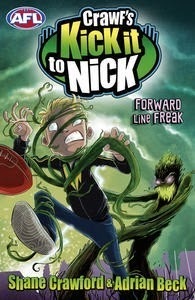 With an easy-read format (and the occasional challenge word) and Heath McKenzie’s illustrations to help readers visualise along the way, the Crawf’s Kick it to Nick series is sure to be a winner with many emerging readers.